Move Up Endurance Coaching is a Kansas City based company geared towards helping competitive and goal driven cyclist reach the next level. We offer 1-on-1 coaching, monthly coaching plans, consulting, skill clinics, and personal training. Kent Woermann is the owner/operator of Move Up Endurance Coaching. 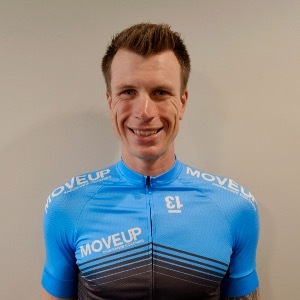 He is currently a certified personal trainer through the National Strength and Conditioning Association and holds a category 1 license in road, mountain bike, and cyclocross disciplines. Kent got his start in cycling by riding on the weekends with his dad when there wasn't a baseball, soccer, or basketball game to attend. At 10 years old he completed his first century ride at the MS150 charity ride (it took all day!) and then continued to do that event each year thereafter. After high school Kent discovered competitive cycling and never looked back. It was the hardest sport he had ever competed in, and the combination of tactics and intensity in road racing had him hooked. After a few years Kent started to compete in the off-road disciplines as well, and quickly discovered it was fun and the perfect excuse to purchase more bikes! He enjoys the combination of power and finesse it takes to navigate an off-road course, and aims to keep improving his off-road skills over the years. Overall, Kent is a guy that loves everything about cycling. Intervals, criteriums, coffee shop cruises, trail epics, and of course geeking out on all the data and high tech equipment. Give him a call to chat bikes and see if he's the right coach to help you Move Up to the next level! Success. Coach Kent Woermann has been notified of your message.